The MASW-011040 is a high power PIN diode SP4T switch in a common anode configuration, operating from 50 MHz to 1 GHz. It features low insertion loss (<0.5 dB) and excellent linearity. It includes two high-power ports capable of handling up to 200W CW and two low-power ports capable of handling up to 100W CW of incident power at a base plate temperature of +85ºC. This high power switch is ideal for use on land mobile radio and MIL-COM applications that require higher CW and pulsed power operation. This device can operate with positive-only DC supplies, making it suitable for switch-filter and power amplifier control circuits. 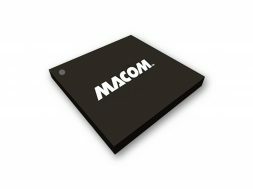 The MASW-011040 is manufactured using the company’s hybrid manufacturing process featuring high voltage PIN diodes and passive devices integrated in a 9mm HQFN 20-lead plastic package. It is compatible with the company’s MADR-010574 PIN diode driver.